Services vary by location. Please click Find a Jiffy Lube® to see a full list of AIR FILTRATION services provided at your location. As much as you enjoy fresh air, your vehicle also needs fresh air in order for its engine to function properly. All vehicle combustion engines require a combination of fuel and air to work well. Without oxygen, the gas or diesel fuels simply can’t burn and give the power needed for the engine to function. The air that is utilized by the engine needs to be cleansed prior to it entering the engine. If it is not properly cleaned, dirt, dust, and debris can build up and can cause inadequate engine performance. When grime and dust are allowed in the engine, they rub on metal parts of the engine causing wear and tear and eventually they will have to be replaced. Essentially, it is much more cost-effective to swap out an old air filter frequently than it is to change the parts of the engine it preserves. 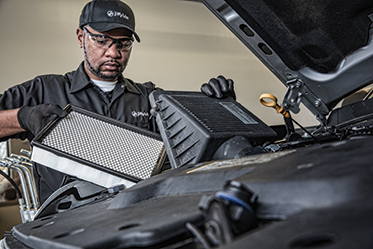 Our engine air filter helps ensure optimal fuel combustion and engine performance, while the cabin air filter helps improve interior air quality for you and your passengers, so that everyone, including your engine, can breathe easier. When it comes to the air in your engine, you’re the driving force. You’re in complete control of the air and fuel that goes into your engine every time you put the pedal to the metal, but the engine air filtration system is always acting as a silent assistant. It filters out any air contaminants and makes sure the air to fuel ratio is as it should be for optimal engine performance. The air filtration system is made up of 3 main parts, and if steady airflow is restricted to any of these components, you run the risk of reducing your fuel economy and engine performance. Oil leaks and subpar acceleration can also occur in the instance of poor airflow. This paper element is responsible for ridding your engine’s air intake system of any dirt or dust particles that could ultimately cause damage to your engine. This paper or foam element takes on the job of filtering the air going into your engine’s crankcase through the PCV (see next) system or a differential-pressure-sensing device like a metered orifice. Also referred to as a metered orifice (see above), the positive crankcase ventilation valve will regulate fumes traveling into the intake manifold. This allows those fumes to burn off and balances the crankcase pressure. We’ll only make recommendations if they are imperative, so no need to worry that you’ll be pressured into unnecessary purchases. Your engine can say goodbye to pollen, dust and outdoor odors that tend to sneak into your car through the ventilation system. The passenger cabin air filter will clean that air as it’s passing through to ensure your interior air is kept fresh.